Perfect for a candy buffet, fill this glass apothecary jar on pedestal with sweet treats for a colorful and tasty display. 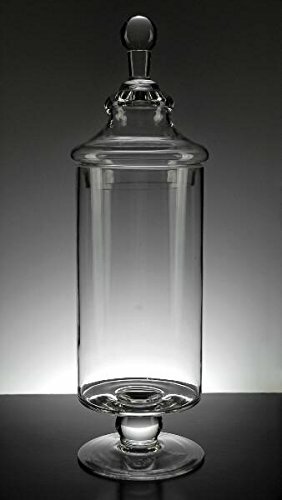 Each clear glass apothecary jar is 14" tall with the lid. The top opening is 4" wide. The base is also 4". Perfect for a candy buffet, fill this glass apothecary jar on pedestal with sweet treats for a colorful and tasty display. The top opening is 4" wide. The base is also 4".